Today was my last orthodontist appt before surgery. 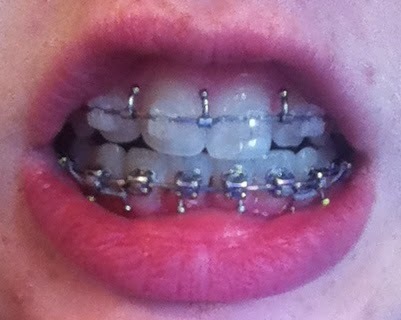 They put surgical hooks on almost every tooth, definitely feel like i have a full mouth of wire! All of the assistants and my orthodontist wished me luck and said they'd be thinking of me on Monday. They even gave me a care package with a tiny toothbrush, syringe, etc which was really nice:). Made me realize how serious this surgery is. Just starting to get last minute supplies for surgery and figuring out what I'll do to waste time the next several weeks! Anyone have any amazing books they've read lately? I am a complete book nerd and am always looking for more to add to my "to read" list:) I guess I don't know what else to add to this post... hmm. Today I am feeling more scared for my surgery. Last night I dreamed that I had surgery and was disappointed when I woke up that I still have to go through it all. Why can't it just all be over?? Okay, back to being more positive. I have been eating a TON of my favorite foods this week, from steak to apples to hamburgers, I've stayed pretty full! I'd love any words of advice or anything I should be doing these last few days before surgery. All of you going through recovery right now are in my thoughts and prayers. Thanks so much to any of you reading :) I'll keep posting!